They’re the constantly-learning shark spotters that will return to our skies smarter than ever this month in a bid to keep beachgoers safe. The Westpac Little Ripper Lifesaver drone, which won a national innovation award last week, is fitted with a SharkSpotter artificial intelligence (AI) algorithm to detect sharks from live video feeds, differentiating them from 16 other types of marine life. “It can detect really accurately the difference between a shark and a dolphin, sharks from so many types of marine life,” Professor Michael Blumenstein from the software school at the University of Technology Sydney said. With 90 percent accuracy at shark detecting, the device is superior to the human eye and gets better with the more images it’s exposed to. The information it collects is beamed directly from the drones to emergency services, lifeguards and water users. “Manned aerial flights have less than 20 percent accuracy, our drones are very efficient, non-evasive and non-destructive,” Little Ripper’s Eddie Bennet said. With spring beach patrols due to start in under three weeks, shark nets have been removed across the north of the state amid outrage they were doing more harm than good. Nets installed following shark attacks around Ballina, Lennox Head and Byron Bay have caught hundreds of marine creatures but only 11 of the targeted shark species. Animals killed by the nets included eight dolphins, nine turtles, 100 rays and 34 protected hammerhead sharks. Results from a NSW Government trial into the nets and drumlines found public support was highest for drone surveillance and lowest for nets. The government has simultaneously been running its own drone trials over 12 weeks, with the Department of Primary Industries marine scientists’ surveillance capturing the beaching of a whale and rescue mission. 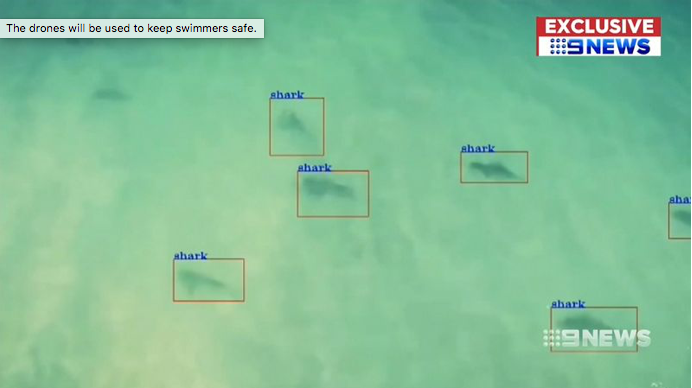 Dr Nabin Sharma from the UTS School of Software said the deep learning algorithms and image processing techniques embedded in the Little Ripper examine live video feeds from the drones to detect the presence of sharks and their potential threat to water users. The system distinguishes between marine life such as dolphins, rays and whales and can identify surfers, swimmers, boats, human beings and other objects in the water. The drone was used in January this year in a rescue at Lennox Head but with the new AI apps, the drones have become even smarter in what they can see below.